Jimmy had a large collection of drum loops and one-shots from a vintage sampler that he wanted to have available to him in a custom Kontakt instrument. His team and him had made some EXS24 versions of these samples but they were not satisfied with those. Jimmy needed two instruments. 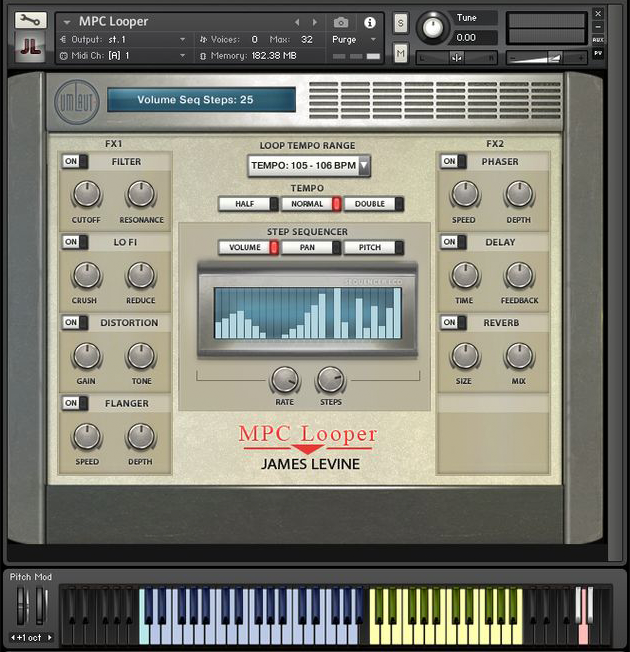 One similar to the Muse Looper instrument with the MPC loops implemented and one similar to the Midi Beats instrument with the one shots implemented. The source files are one-shots of jimmy’s samples arranged in three ‘modules’; Kick, Snare, Hi-hat. Each module is triggered via MIDI with its own key. Each drum ‘module’ has a dropdown menu for choosing a sample within its sound category, A kick module, for example, will have a dropdown for choosing different kick samples. Each drum module has the following controls: Volume, Pan, Tune, Decay, Filter type, Filter Decay, reverse switch. The source files are Jimmy’s loops arranged in keymaps. Loops will sync to host tempo. Primary dropdown menu for choosing groups of loops in similar tempo ranges. Loops to follow host tempo. Three key switches for playback speed: Half/Normal/Double. These work on the fly. Seven key-switches function as momentary switches for insert effects. Step sequencer for the user to choose the number of steps and rate (synced to tempo) controlling Volume, Pan, and Pitch.